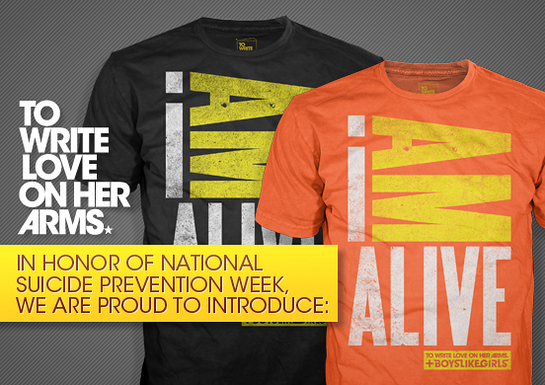 Proceeds from these shirts will go toward the launch of IMAlive, a live online crisis network. Boys Like Girls have been long-time supporters of TWLOHA, and this past spring shared the road with TWLOHA for The Bamboozle Roadshow. During the tour they spent a lot of time talking with lead singer Martin Johnson about how suicide has personally affected his life. In 2006, Martin lost one of his best friends from high school to suicide. To Write Love on Her Arms is a non-profit movement dedicated to presenting hope and finding help for people struggling with depression, addiction, self-injury and suicide. TWLOHA exists to encourage, inform, inspire and also to invest directly into treatment and recovery.